My son and I made a quick visit to the McPhillips Athletic Grounds just south of the CP Winnipeg shops on June 25. From there you can view the shops, provided there aren't any trains in the way. Unfortunately there were trains in the way, so I didn't get great shots. I did log the 23 locomotives I saw there. CP 1553 and CP 5863 were shunting. I've seen GP9 1553 before, but SD40-2 CP 5863 was new to me. SD40-2 units are still fairly common on CP, but what makes 5863 interesting is that it is one of the only two CP units remaining with a full size multimark. Other interesting units were CP/SOO 6023 (in white) and "red barn" SD40-2F CP 9002. I saw leased CEFX 3125 moving around, and there was another (bigger) leased unit there but I could not get the number. I did see some interesting graffiti on NAHX 57283. I'm torn about graffiti on train cars. Obviously I think it's wrong because it's vandalism. However, some graffiti is very artistic and I think this is a good example of that. These days it is hard to find a train car without some form of graffiti on it. How you feel about graffiti on train cars? I was in St. Stephen, New Brunswick this past week and took numerous photographs of the former Canadian Pacific Railway station there. Trains still visit St. Stephen a couple of times a week, but there are no rails to the station any more. Construction on the current station began on June 1, 1929 and it was completed in late November 1929. The last CP passenger train departed for McAdam on August 16, 1958 (gas-electric CP 9008). After that SMT provided bus service from the station until 1967. In 1971 the town bought the station and used it for the St. Croix public library. In 1999 the library moved to a new building very close by, and the station became the tourist information centre. I thought it would be fun to compare current photos against those of days gone by. I found a selection of photos showing the station from the same viewpoint. I did not take a photo of the station from that viewpoint myself, because it would have been directly into the sun. Here is the station in 2000, after it was a tourist information centre. This is basically how it looks today. This photo is by J.A. Clowes. Here it is in 1988, again taken by J.A. Clowes. At this time it was still the town library. The station was not terribly clean. Note the derelict rails in the foreground. Now we go back to 1958. The photographer is unknown. Note the awning on the rear of the station, no longer present. The last steam train to visit St. Stephen was headed by CPR 986, a D10 class 4-6-0. It went to St. Andrews and St. Stephen before returning to McAdam as train 51. Its fires were dumped and it joined the dead line at McAdam. Here is a postcard depicting the previous station in St. Stephen. This postcard is from around 1900. This station was built in 1877 following the disastrous town fire of 1876 that destroyed the majority of the business district. It served as the headquarters of the New Brunswick and Canada Railroad. I think that is the freight house on the left. In 2016 the St. Stephen station will be refurbished and upgraded. The tourist information centre is leaving and two new businesses will be moving in (CBC article). I was flying back from New Brunswick this past Thursday, and on the Saint John-Toronto leg I was seated next to a gentleman who turned out to be a professional photographer / videographer. He had his video equipment in the overhead bin, next to my camera. We started talking about photography and he showed me quite a few of his photographs. He was very nice and gave me some tips on photography, accessories and post-processing. When you take photographs, you're telling a story. The story is more important than the technical details. Always think how a shot could be improved. It was a really good conversation and really inspired me to try to take better photographs. PS - The airplane above is an Antonov AN-124-100, shot in Winnipeg on June 19. The AN-124 is the second-largest operating cargo aircraft in the world (after the AN-225). I have no idea why it was in Winnipeg. As I mentioned, I was in New Brunswick this past week. On Sunday June 19 I flew out of Winnipeg at 8 AM. On my way to the airport, I stopped at CN's Rivers subdivision and found an eastbound train coming. It turned out to be CN 8956 on the head end with Dash-8 CN 2421 trailing. Anyway, on to New Brunswick. In CN's Island Yard I found CN 4132 and 4141 shunting. I have seen very few of the CN 4xxx GP9s. The 70xx GP9s were much more common in New Brunswick. After viewing that and the Herzog ballast train with CN 2512 and CN 5694, I met my family for supper. Afterward, I headed over to the NB Southern yard on Dever Road in the evening. I went to the west end first, and found NBSR 2318, slug NBSR 008 and NBSR 9802 shunting there. I watched them for a bit then went to the east end of the yard. Imagine my surprise to see the Herzog train's engines there. As I watched, CN 5694 and 2512 rolled up to the shop, presumably to get serviced before their trip back up CN's Sussex subdivision to Moncton and beyond to drop ballast. That's NBSR 9803 and NBSR 2610 beside them, and I think NBSR 3701 on the other side of the shop building. Caboose NBSR 422990 is just off the right side of the photo. Just to the left of that photo is the rest of the yard. There's a lot going on in this photo. On the left you can see the hulk of NBSR 3700, leased caboose CN 79624, and you can just see the number board of NBSR 9802. On the right you can see NB Southern's passenger train. In the background is a set of wood chip cars with an open top Sunbury chip truck beside them. That was the extent of my railfanning that week. I spent the rest of the week in St. George, far away from any trains! I was in southern New Brunswick earlier this week on business. I arrived on the afternoon of Sunday June 19, so my thoughts turned to railfanning in one of my old haunts. Who am I kidding... when do my thoughts turn AWAY from railfanning? I found a CN ballast train parked near Crosby's. CN 2512 and CN 5694 were the power on the head end of a string of Herzog ballast cars. The Herzog cars were in New Brunswick back in July 2009 on the northern line. What's special about the Herzog cars? The "PLUS" train basically automatically dumps ballast at up to 20 MPH at pre-programmed locations. It uses GPS to determine the location and drops the ballast as it goes. This eliminates the need for ground crew, making it safer and faster than traditional ballast cars. CN has been getting ballast from NBSR in the past few weeks. Apparently it is being dumped on the CN Springhill subdivision. One load was dumped around Sackville, NB and another around Folly Lake, NS. There has been a lot of chatter about these trains on the excellent RailsNB mailing list. CN seems to be providing the power and the Herzog cars. Dave Dineen shot a great video showing the train being loaded in NBSR's Dever Road yard, then rolling across the Reversing Falls bridge. The train was run as CN 439. You can see that spacer (box)cars were used to separate the engines from the train, and there is a boxcar between every four loaded Herzog cars on the front part of the train. This is done to reduce loading on the bridge. Saint John train watchers may remember that NBSR did a similar thing in 2005 when they were taking loaded gypsum cars across the Reversing Falls bridge while doing maintenance. The empties seem to come back to Saint John on CN 406 with the two units on the head end. Here's a video from Gerald aka SD40dash2fan showing CN 406 around mile 71 coming into Saint John. He has another one showing 406 rolling over the little CN bridge at the far end of Rothesay Avenue in Saint John. PS - I saw the Herzog cars on CN 303 at Elie, Manitoba a while ago. Want To Work At IRSI? Moncton-based Industrial Rail Services is hosting a job fair on Saturday, June 25 from 10 AM to 2 PM. They want to hire 55-75 people to work in their shop, and they are looking for various tradespeople. IRSI's web site has a fairly recent aerial photo on it, showing their shops and the two new buildings they built to handle the recent VIA Rail LRC project. There's a diesel switcher on the right side of the photo that looks a lot like the Courtenay Bay Potash switcher but probably is not. On June 16 I went up to Wilkes Avenue to shoot the Canadian. I wanted to shoot them at the Shaftesbury Boulevard crossing, just to show how poor that intersection is. There is a traffic light just south of the crossing and there is room for maybe two cars between the tracks and the intersection. Often cars stop on the crossing itself. It's a wonder noone gets hit. Anyway, I heard that VIA 6414 (the Loto Quebec unit) was leading the Canadian, so I changed my plans slightly and backed away from the crossing to get more of the train in the shot. They were about 15 minutes late. I shot each car as it went by (to record the full consist) and afterward I noticed that a friendly passenger in Chateau Rouville gave me a wave. I headed back south on Kenaston, only to find two CP GP9 units ready to cross the road near Lafarge... remember Lafarge's little engine? After I parked, they took off and I took a quick video of them running north on the La Riviere subdivision. The paint scheme on 8213 for some reason reminded me of a recent post on Adam Walker's blog featuring CP 8216 in Ontario. On June 17, I had to get out of the house for a while, so I took my laptop and drove to the south end of Symington and parked there while I did some work. Of course I brought my camera and scanner, so I was able to keep tabs on CN's activities on the Sprague subdivision. "15 year" CN 7258 and slug CN 268 were on the hump. It was odd to see just the GP9 and slug there, rather than the usual matched set of two GP38s and two slugs. There was a humpyard set elsewhere in the yard with another "15 year" engine on it but I didn't catch the number. It was pushing a train onto the hump with these MOW cars loaded with track components. I parked at Navin at the former crossing and waited. The crossing was blocked while CN did their track extension in the area, and it looks like the crossing will be permanently closed. The nearby crossing at Tinkertown is not far away. Soon enough CN 198 came rolling by with CN 8812 leading and CN 2668 trailing. This was a solid container train. Things were quiet on the Sprague for a while. I heard that work train CN 909 was up at Transcona with an SD40-2. It was destined for the Sprague to drop cars off at a few places, but it didn't come by while I was trackside. About an hour after CN 198 came through, I heard CN 346 was getting ready to head out. There was a CN MOW crew down at Tinkertown ready to give them a rollby inspection. I drove down just south of the Floodway to shoot 346 on the bridge. I parked and tried walking closer to the bridge for a better shot, only to get my feet wet in a bog. Sandals are not proper hiking footwear! I stood with wet feet and took this shot of CN 8870 leading the train over the bridge. Everything in the foreground is marshy... I'll have to try to get a closer shot in drier times. The other two engines were CN 8817 and "old-timer" CN 2424. Note the white-painted "2424" above the cab windows. CN 346 had three empty container flats on the front, but was mostly tank cars with the occasional hopper or boxcar, with a solid string of autoracks on the tail end. I headed home to wash my feet and chisel the clay off my sandals! PS - I was looking at the photo of CN 7258 and noticed the lawn chair and park bench up on the hump for the first time. I don't know if they are new or not, but I guess they are there for the remote control operators to rest their weary bones while sending train cars over the hump. I haven't watched the hump operation closely enough to see if there are two operators, but I assume one of them operates the train while the other uncouples the cars as they come over the hump. I want to point you to a site hosting some excellent train photos. Walter Pfefferle hosts a site called RailPast Photos that contains his excellent train photographs. He has it divided into galleries by railroad, much like I do. For example, he has VIA Rail, CN, CP, and shortline pages. Walter also posts many videos on YouTube. On May 18 I was driving home along the CN Rivers subdivision when I spotted this "tie train". A truck was at the head of five flatcars containing ties and a crane. This was quite remiscent of the Herzog tie train I saw in February. The truck is labeled as CN 433-29 but also CN 074056 on the door. Very confusing. It is a Brandt rail-mounted truck built on a Western Star truck chassis, and includes couplers at both ends, headlights on the roof, flashing lights and a horn. The crane, CN 691-00, was apparently picking up old ties. When I stopped it was not moving, perhaps in preparation for a passing train. As I went on my way, I was stopped at the Perimeter by a short CP train heading north on the La Riviere subdivision. The usual suspects CP 1128 and CP 3028 were leading, but what was interesting was the set of 9 "branchline rehabilitation" hoppers trailing the power. Each are labeled "Government of Canada Branch Line Rehabilitation" / "Gouvernment du Canada Remise en Etat des Embranchements Ferrovaires". They are 263,000 lb cars - light enough for light branch lines, of course! Canada spent around $1 billion in the 1970s and 1980s to rehabilitate Prairie branch lines. CN and CP bought numerous hoppers under this program, as well as material to upgrade fragile Prairie branch lines. No doubt this extended the life of some branch lines, but in the end a lot of them were abandoned anyway and more are still being abandoned. CN and CP retain ownership of the hoppers and they are used for maintenance work on occasion. CN's are painted orange. I miss those green and yellow engines! Here's a few videos to show what I mean. Dave Dineen posted a video of two NB Southern main line trains, one westbound at night and one eastbound in the afternoon. The video has his usual high quality shots. Gary Lee posted a video of NB Southern power shunting cars in McAdam. All three 23xx units were there, along with 2612 and slug 008. I found this one by NiCu00121 of NBSR 2612, presumably in St. Stephen, given the short train and the caboose at the end. The videographer claims the train broke down but I'm guessing it had some wheel slip problems. In early May I was criss-crossing the Maritimes on business. You might recall my shots from Moncton and Halifax. On May 7 I was in Fredericton and visited the train station after supper for a few minutes. I wanted to see the restoration progress for myself. It is quite striking! The liquor store in the rear is in service and there was considerable traffic when I was there. The former Hartt shoe factory is visible on the right edge of the photo above. The sign in the photo above says the heritage restoration is being done by Fabinex. I walked around to take a shot of the south side of the buildings. You can see that work is still in progress here. The station is connected to the liquor store via a glassed-in walkway visible on the left edge of the photo above. Here's a closeup from the previous photo. The station looks a lot nicer with a roof, windows, and the brickwork cleaned. There was a distinct lack of pigeons, too! I stuck my camera up to a couple of windows to try to get some interior shots. I think they turned out pretty well. The above is shot from the south side. You can see a bit of what could be original wood on the left, brickwork on the north wall, and what might be laminate flooring. The ceiling looks nice but I have no idea if it resembles the original ceiling. The above was shot from the west end (adjacent to York Street). I think there is some kind of bar / kitchen at the west end of the station. You can see some kind of stainless steel fume hood at the top of this photo. I hope you enjoyed this brief glimpse of the work in progress. I hope to visit the station again this summer to check on how it is progressing. It sure makes me happy to see the work that has been done. My family and I went to the excellent Fort Whyte Alive centre to walk and see the wildlife. While we were walking over boardwalks and past marshes, my wife spotted some train cars in the distance. Fort Whyte is adjacent to the Lafarge cement plant and there was an industrial switch engine there too. This pretty little engine is a GE 50-ton engine, built in October 1954. The Lafarge facility is served by both CN and CP. It is at mile 7.4 of the CP La Riviere subdivision and is also on a spur from mile 5.0 of the CN Rivers subdivision. As you can see, Lafarge has quite a few rails. I received Eric Gagnon's book, "Trackside with VIA: The First 35 Years", with eagerness. I read it in one sitting and I definitely enjoyed it... with a few reservations. Eric is the author of Trackside Treasure, an excellent blog on Canadian railways. Eric has also been chronicling the production of this book on another blog. I'm going to start by saying what the book is not. It is not a coffee table picture book. It is not an exhaustive history of VIA Rail. It is not a Greg McDonnell book. Physically, it is a 114-page book, containing mostly text with some black and white photos, soft cover and perfect bound. Eric is selling it for $25 (including shipping in Canada). Each section has a page of text talking about the changes in VIA during the period, together with a half dozen or so black-and-white photographs. The real meat of each section is a list of trains he saw during that period, with times and locations and all the engines and cars he noted for each train. We railfans call these "consists". These are a treasure trove for train researchers, as well as anyone wondering what kinds of engines and cars VIA hauled at various times in its life. The book also includes a foreword by Jason Shron of Rapido Trains, paint transition data (for the modeler, provided by Jakob Mueller), a brief VIA roster, train schedules in the Ontario-Quebec, the various Canadian/Super Continental routings, and recommended readings. I think Trackside with VIA is a book by a railfan, for railfans. This book will appeal to VIA Rail enthusiasts, and train enthusiasts in general. I don't think the "general public" (whoever that is) would really enjoy it, and they are not the intended audience. The book is well written, with very few typos, well laid out, and it is professionally printed. I love the cover - it is very reminiscent of VIA timetables from days gone by. This is a quality product. I said I had a few reservations. Most have to do with how the consists are presented. They are basically a wall of unadorned text, page after page. For example, the 1982-1986 consists are 17 pages of text arranged in six columns. There are no photos on the consists pages and no adornment of the text at all. Eric made the conscious decision to not list train numbers unless he was sure of the number. I understand his reasoning but it makes it hard to locate trains such as the Canadian. I found there were some gaps in the list of VIA engine and car numbers in the rear of the book. As an example, there is no information in the list for what type of car VIA 3250 was (my 1989 Trackside Guide tells me it was a coach with a snack bar). I don't want it to seem like I hated the book. I like it and I will use it often for reference. But the consist pages were a little off-putting at first, and it has taken a few reads to get used to them. I recommend Trackside with VIA: The First 35 Years to anyone with a serious interest in railways, especially the history of VIA Rail. As Eric notes in his recommended reading section, there have been very few serious books on VIA Rail. Now there is one more. Greg Brewer took this slide of CN 2338 in Moncton, NB on June 17, 1984. CN 2338 has had a bit of a charmed life. It is an MLW M-636 (class MF-36b) built in 1971. It was retired on June 4, 1996 but unbelievably was un-retired twice in 1996 before finally being retired on January 23, 1998. It was configured in 1999 to be an emergency generator for the MacMillan Yard diesel shop in Toronto, Ontario as part of CN's Y2K preparations. It was not needed, but remained in the yard for years afterward. There was a lot of railfan discussion about what would be done with CN's last big MLW unit. Amazingly, CN 2338 was sold in late 2010. It was sold to Railroad Power Leasing and became RRPX 2338. It arrived in Buffalo, New York on November 9, 2010. RRPX already had three other M636s among other Alco products. I believe RRPX 2338 is going to the Claremond Concord Railroad in New Hampshire but I could be mistaken. The new CN 2338 is a GE ES44DC. I haven't had the pleasure of shooting it yet, as it is pretty much brand new. 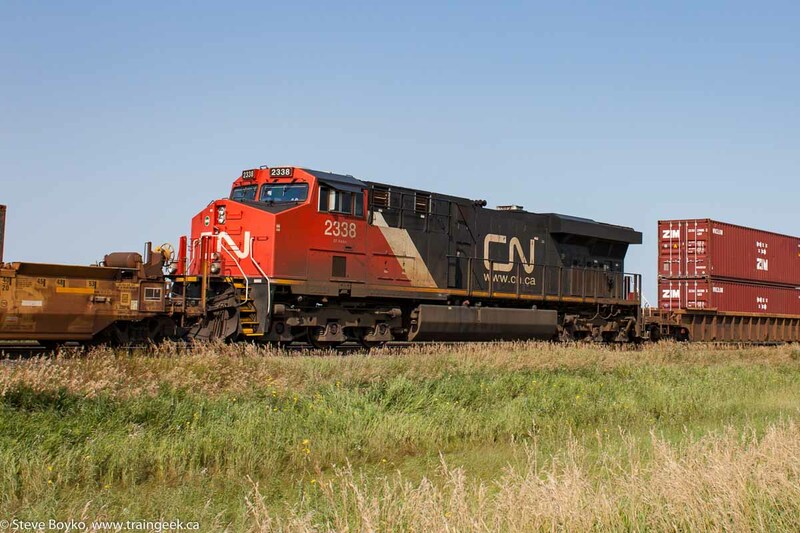 Here is the new CN 2338, photographed on July 31, 2012. I stumbled across this video on YouTube. It was produced by Britain's Network Rail and shows three railway crossing near misses. The last one is especially scary as the person was so close to the speeding train that they lost their shoe. They are VERY lucky. There is no need to "race the train". A few seconds or minutes of waiting is a small price to pay for your life. Good news... Greg Scholl Video Productions has acquired the titles of Rail Innovations, a former Canadian video company. Rail Innovations produced a number of unique Canadian videos and Greg Scholl has reworked 10 of them. I have a few Rail Innovations videos and the content is great and so is the production quality. I saw CCGX 5232 and CEMR 4001 waiting at the beginning of the CEMR Carman subdivision today around noon. Noone was on board so I assume the crew ran out of time after going down the Carman and back again. I noticed 5232 has some prominent antennae on the roof. I never paid much attention to them, but it's clear they have been there since I first saw ANY 5232 back in September 2009. They must get good reception with these babies! On June 9 I was heading home from work, and decided to detour out to Diamond just west of Winnipeg to see if there was any CN action. I did see something on the rails as I approached, and it turned out to be a Sperry truck, SRS 863, on the north track. I also saw a CN train approaching, and it turned out to be CN 314 led by engine CN 8820. After 314 went by, I took a few shots of the Sperry truck before it headed west. NBSR 9801 has been relettered and renumbered to MNR 9801, for the new Maine Northern Railway. The what? The Maine Northern Railway Company is the new name for the northern Maine lines to be operated by NBSR. MNR 9801, NBSR 2317 and NBSR 2319 are now in Maine and will be operating on the line. The official opening date is June 15 (tomorrow). This is not the "permanent" power as it will be rotated back to Saint John as needed for servicing, so northern Maine should see a variety of green and yellow engines. Good luck to J.D. Irving in their new enterprise in northern Maine! PS - there is a good article in MaineBiz about the transition, featuring an interview with Ian Simpson, general manager of the Eastern Maine Railroad (NBSR's Maine half). Presumably Ian will be the GM of MNR as well. The MNR will employ up to 30 people and will be based in Oakfield and Squa Pan. An exhibit developed by the Fredericton Heritage Trust and the Fredericton Region Museum will be unveiled at Fredericton's City Hall gallery on Tuesday, June 14 at noon. The exhibit is entitled "A Celebration of Union Station" and features eight panels showing historic railway photos and text. The mayor will speak and admission is free. The exhibit will be at City Hall until the end of July, and will then move to the Fredericton Region Museum (formerly the York Sunbury Museum) for two months. I was contacted about this exhibit and four photographs of mine are among the 60 in the exhibit. I always like seeing the "older" power on CN trains. On June 4 I saw two different trains with "old" EMD SD60 units leading. First I saw this train heading into Winnipeg. I shot CN 5506 just east of the mile 10 hotbox detector. My son and I were out of the car, giving it a rollby inspection on the south side. The engineer gave us a wave and a toot as they rolled by. Later in the day, we were heading back home when I spotted CN 532 heading south on the CN Letellier subdivision. A quick exit at Pembina Highway and we were ready to shoot. Here is CN 5553 passing under the Perimeter Highway. CN's SD60F units were built by GM's Electromotive Division (EMD) in two lots, four in 1985 and the rest in 1989. I may be wrong but I think they were the last CN units built with the "Draper taper" to enhance rearward visibility. The first four units were initially called SD50AF and numbered CN 9900-9903, but were renumbered to CN 5500-5503 in 1988. The units built in 1989 were numbered 5504-5563. The cab is slightly different on the later units, and the later engines weigh about 6 tons less. They are equipped with a 16-cylinder 710 engine, a departure from the 645 engine used in the SD40s and SD50s. The 710 has been upgraded several times over the past 26 years and is powering the new SD70M-2 units. Out of the 63 surviving units (CN 5514 was lost in 1993), I have seen 27 of them. I often saw them in Saint John on CN 305, and occasionally on CN 308 such as this shot from Deersdale, NB. I find it interesting that some of them still have the road number painted above the front windows. All of them now have number boards on the nose, under the classification lights. I wonder why the number boards weren't mounted above the windows? Maybe there wasn't enough room for the lights and the number boards. Let's hope these old Draper Tapers keep working for many years to come.